Located in the desirable community of Dodger's Hole. This lovely four bedroom home features a large custom kitchen and breakfast bar with upscale appliances and everything needed to create casual snacks or gourmet feasts. The adjacent dining area seats eight or more. 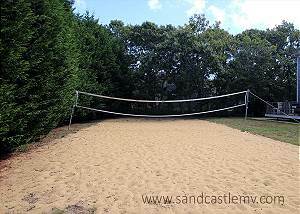 There is a spacious deck with patio furniture, gas grill and an enclosed outside shower overlooking the large backyard with true sand volleyball court. The master bedroom with King size bed and private bath is located on the second level. Three additional bedrooms and a full bath complete the guest sleeping area on the 2nd level. There is also a half bath located on the first level. Central A/C, two flat screen TV's and WiFi are provided for your comfort and entertainment. Close to the bike path and hiking trails in the State Forest and Felix Neck Sanctuary. 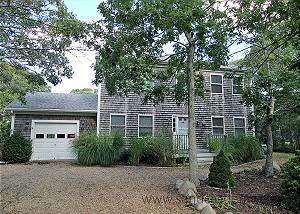 This Vineyard colonial is centrally located and a short drive to all three down island towns and public beaches - make this lovely home ideal for vacationing families! Ferry tickets available (at tenants expense) for the weeks of July 7th & August 18th! July weeks reduced to $3250! !